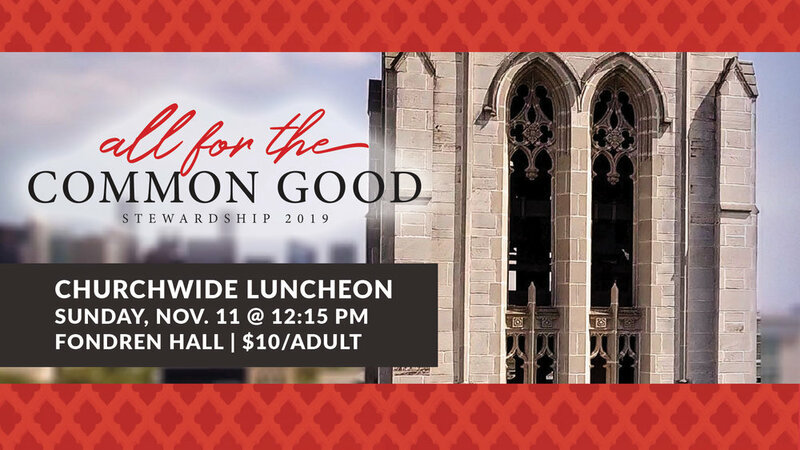 You are invited to "All for the Common Good" Churchwide Stewardship Luncheon on Sunday, November 11, at 12:15 pm in Fondren Hall. Rev. Tommy Williams, senior pastor, will share about the milestones accomplished through St. Paul’s this year and where we anticipate God leading us in 2019. All are welcome to attend this informative and inspirational presentation while we enjoy lunch together. Pot roast with rich brown gravy, carrots and potatoes seasoned with fresh herbs, green salad, and rolls. Dessert: apple caramel bread pudding. Vegan/vegetarian: Kale pesto pasta with cherry tomatoes. Tickets to the luncheon are $10/person. Make your reservation online (deadline extended! ), or pay at the door. While adults attend the luncheon, children (ages 3-5th grade) can participate in the Children’s Advent Art Festival in J-120 with a free lunch provided. Youth (6th-12th grade) have the option to attend the luncheon or assist the younger ones with their art projects. Nursery care will be available for babies and toddlers.